HTC is up next and the company is unveiling its latest competitor in the midrange in the face of the HTC Desire 820. 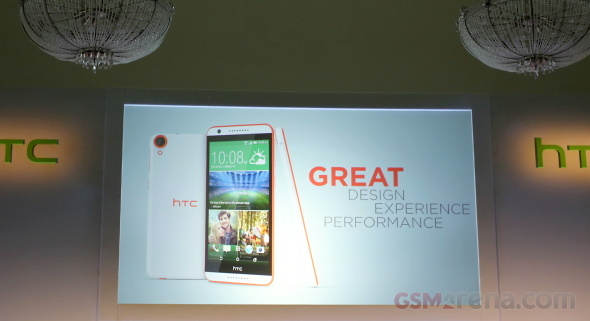 Sporting brand new specs, it aims to replace the Desire 816 that was a popular device, especially in Asia. The HTC Desire 820 comes with the same display technology - a 5.5" 1280 x 720px Super LCD2 with 267ppi. The BoomSound speakers remain intact on the front and so is the main 13MP camera but the front-facer has been bumped to 8MP. The Snapdragon 400 has been replaced by a 64-bit Snapdragon 615 with an octa-core Cortex-A53 processor with four 1.5GHz and four one-gig cores. The RAM has been upgraded to 2GB and the graphics chip is now Adreno 405. HTC has retained the 2,600mAh battery that powers the smartphone but once Android L hits it may be able to last longer. The HTC Desire 820 offers a two-toned unibody with different color accents. It's big but also very slim at 157.7x78.74x7.74mm. Finally, the HTC Desire 820 will have LTE Cat 4 for 150Mbps downlink and an optional dual-SIM version that will hit select markets. The midrange smartphone will make it to the shelves by the end of September. See you after the break for our hands-on. The HTC Desire 820 is a big handset but feels light, even if it doesn't look it. It comes in a bunch of paint jobs: Marble White, Tuxedo Grey, Santorini White, Milky-way Grey, Tangerine White, Saffron Grey, Flamingo Grey, Blue Mist, Monarch Orange - all but one of which made of glossy plastic. The Tuxedo Grey is the sole exception - it's matte. The display of the HTC Desire 820 is quite good overall. It has wide enough viewing angles and we like the way colors pop when you're viewing it head on. Brightness is pleasant and the only thing we aren't completely sold on is sharpness - at 267ppi it looks sharp enough at arms length but pixels are visible if you look closely. The MicroSD card and nanoSIM slots are located on the left of the _phone_ under a very large flap. On the right you'll find the volume rocker and power/lock button. The glossy finish makes fingerprints an issue. The glossy plastic got smudged incredibly fast and looks hard to clean. The matte variant should be immune to that. The camera lens protrudes from the otherwise slim body and we found ourselves touching the lens all the time. That mainly because it's quite big and takes up a lot of space at the back. The camera is a 13MP unit and has a single LED flash under it. We like the color accents. Here goes a video of the HTC Desire 820. As you can see the _phone_ runs smooth on Snapdragon 615, Sense 6.0 acting quite fast and fluid. We ran a couple of benchmarks on location. The Snapdragon 615 didn't really blast through AnTuTu 4 but did a fine job besting its peers in Basemark OS II. The MicroSD card and nanoSIM slots are located on the left of the phone under a very large flap. On the right you'll find the volume rocker and power/lock button. Here goes a video of the HTC Desire 820. As you can see the phone runs smooth on Snapdragon 615, Sense 6.0 acting quite fast and fluid.